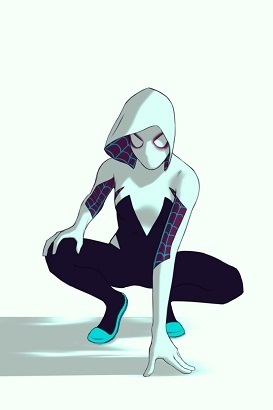 Powers and Abilities: "what ever a spider can"
Gwen Stacy is the daughter of a cop, but she was not like him. Gwen is more free spirited, more artistic. She hid in her music, and especially with her friend, Peter. An accident during a field trip gave her the wonderful powers that she has today, that of a spider, and while she always used her powers for good…she couldn't help use them MOSTLY for her own benefit. It was her father that instilled the idea to help people…to TRULY help people. Unfortunately, Peter was desperate to be like his new idol, that wonderful Spider-Woman, and injected himself with a serum that transformed him into a lizard. She was forced to fight him, and when he returned to normal, the injuries he had sustained killed her best friend. Wanted for murder, she was on the run from the police, and most importantly, from her own father. But that didn't stop her resolve to fight crime. She worked harder to put people away, until it brought the attention of the kingpin on her. Thwarting an assassination attempt on her father's life, she has promised him and herself to always fight for the side of good, and use her powers to bring down the criminal underground as best as she can. All while trying to get a gig with her band! A life of being different leads her to escaping to the rooftops or to her drums to be alone with her thoughts and her music. If you've got the sick burns and terrible puns to spare, might as well spit them out! She strives to honor Peter and her father and use her powers for good. Rid the world of criminals like Kingpin and his ilk. Spider-Gwen's bite has given her immense super strength, allowing her to lift up to 10 tons. This extends to her legs as well, allowing for superhuman jumping ability as well. She can run at speeds reaching those of a fast moving vehicle, even though she prefers to not travel that way, preferring to swing through the city. Reaching top speed and in times of great peril, she can most fast enough to appear more like a streak of white and black. Along with her speed comes unnaturally adept agility, her body able to contort and stretch to levels outside of natural human ability. She can outperform seasoned acrobats, and easily match or even top olympic level athletes at gymnastics. She has perfect balance, and can achieve equilibrium in any position, on any surface, no matter how small or narrow. Gwen has a low-level form of Wolverine's regeneration, allowing her to heal herself after a period of rest. She has been known to recover from serious injuries in hours. Like most Spider-People, she has the sense that allows her to detect immediate danger through a tingling at the back of her skull. It's linked with her superhuman abilities, allowing her to dodge most anything. HOWEVER, it's proven less than reliable in the past, leaving her occasionally either dodging nothing, or taking the full brunt of an attack. Her suit allows for the use of her newfound ability to cling directly to the sides of walls, and carry a weight of multiple tons as she does it. Given to her as a gift from a retired superheroine, her web shooters trap moisture from the air and synthesize a web-fluid that allows her to shoot ropes, nets, and other forms of the super strong webbing. The webbing loses adhesive qualities when exposed to air, allowing her to grab and maneuver the webbing, but still allowing it to stick strong at the attachment points. After an hour, the webbing dissolves into an untraceable powder. She's a pretty awesome drummer. Her father is a captain in the police, allowing her access to inside information that the police have. She doesn't like to use it though. For reals. She's a pretty good drummer. As the daughter of a police captain, she has grown up around police work and analytical thinking, and has developed a strong aptitude for it. She is very protective of her secret identity, and if it were to be discovered, her family and friends could be easily found and punished for her actions. In the end, she is still human. Being shot can still kill her, being stabbed can still kill her if aimed sufficiently. Her regeneration is nowhere near that of the X-Man Wolverine, and if the damage is devastating enough, she can die. What is also a great advantage can also be a terrible hindrance. Her spider-sense is spotty at best, leaving her dodging the wrong things, or totally unsuspecting of others. She is currently wanted in connection with the death/murder of Peter Parker. Peter of course died due to combat with her while he was in a transformed state akin to The Lizard…but he succumbed to his injuries after returning to normal. Unable to explain, and with no proof of the transformation, she runs from the police and their questions, trying to sway the public's opinion of her constantly. Comin' straight at you from Universe 65! Woooooo! Logs tagged with "spider-girl" and "re:spider-girl" will appear below automatically. Logs prior to March 30th 2017 are from a previous instance of the character. 29 Aug 2016 16:44 (2016-08-29) Hello Gwen!